THE SKINNY: Pronto Texture and Volume spray is supposed to be a hairspray that adds texture to your hair. Unfortunately, the only things it did for me is make the bathroom smell funny and put a clear layer of grit on the counter. I've sprayed and sprayed and sprayed this product and never seen any result. It's made with a whole bunch of stuff I don't recognize: Natural volcanic mineral zeolite, copolymers, hydrolyzed wheat and keratin proteins and humectants and UV absorbers, according to the company website. That list alone kind of scares me. I'm moving on. KEEP OR TOSS: Toss. I'm tired of cleaning the bathroom counter. 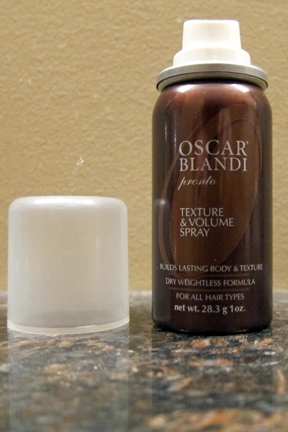 CHECK IT OUT: Find directions on using this products on the Oscar Blandi website.